He has defended his veto of $55.7 million in one-time funds by saying the solution to improving student performance is not to simply throw money at the problem. He doubled down on that Monday, saying he prefers the state make more targeted investments in high-priority education programs rather than making a blanket allocation of dollars. The position Branstad laid out Monday represents a departure from what are typically considered core conservative values, which put a priority on taking decisions out of the hands of state and federal politicians and giving control to local leaders. What money is he talking about? 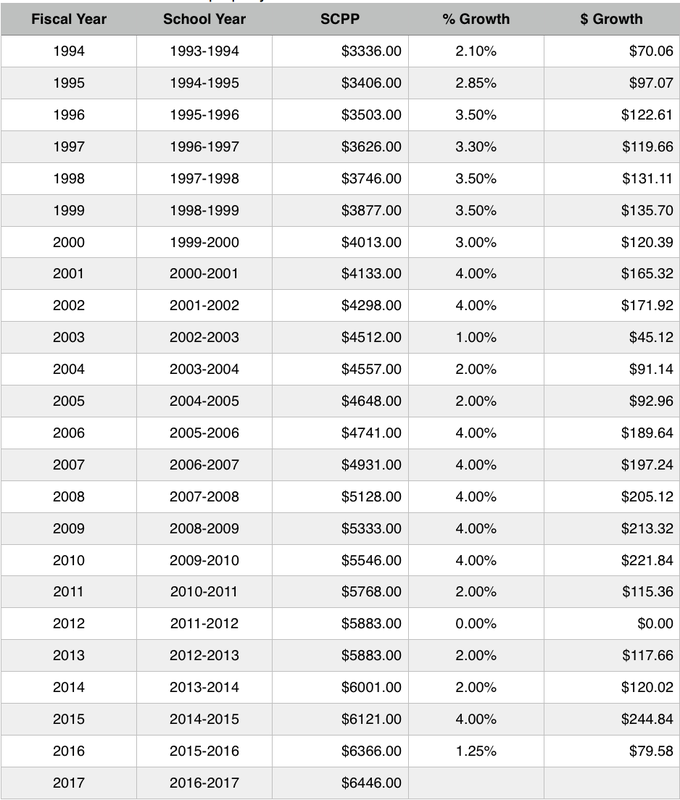 Let’s take a look back at the last twenty years of Iowa educational funding. In 1994, the State Cost Per Pupil was $3,336 and the allowable growth (now state supplemental aid) was set at 2.1%. As a brief review, State Cost Per Pupil (SCPP) is set by multiplying the previous years SCPP by the growth rate. Thus, SCPP for 1995 would be $3,406, a 2.1% increase from $3,336. The state is responsible for funding 87.5% of SCPP from the General Fund. The revenue for this 87.5% comes from a property tax of $5.40 per $1,000 of assessed valuation on all taxable property in each school district. Districts can fund up to the other 12.5% with additional property taxes. This information was taken from the Legislative Services Agency’s summary of Major School Finance Law Changes from 1971-2014. In the report, you can see the specific legislation each year that set state supplemental aid/allowable growth and how this determined the state cost per pupil. Before 1993, SCPP was determined by a formula based on inflationary and economic factors. I am doing more research on what this formula looked like. Just as an added point of information: Terry Branstad served as governor of the state of Iowa from 1983-1999 and again from 2011-Present. From 1999-2007, our governor was Tom Vilsack. From 2007-2011, our governor was Chet Culver. So it would appear we are $936.68 above what we currently need based on inflation, right? This would only be true if education were exactly the same in 2015 as it was in 1993. The world has changed quite a bit in the past twenty-two years. Does $936.68 per student really reflect what has changed in education over that time period? Think about what has been implemented just in the last fifteen years: No Child Left Behind, Race to the Top, 1:1 initiatives, Common Core, Iowa Core, and that is just naming a few. Add in the shortfalls accrued across that time period ($784.55 per pupil), and we are very behind. The Iowa Association of School Boards estimates that the cost of education rises approximately 3% each year. That would mean for next school year alone we are behind by at least $111 per student. Compound this over the several years we have been underfunded (2002-present) and we are very behind: Assuming that FY2003’s original SCPP was “adequate” at $4,512 prior to the 4.3% across the board reductions, increasing this cost 3% annually would result in a SCPP of $7,029.55. That’s $583.55 per pupil less than we will be receiving! The number of minority students in Iowa’s public schools continues to increase and is at an all-time high (100,151). Minority students make up 21.1 percent of the student body. The percentage of students eligible for free-or-reduced priced lunch increased slightly in 2013- 2014. 41.1 percent of Iowa students were eligible in the 2013-2014 school year compared to 41.0 percent in the 2012-2013 school year. The number of students who are English language learners (ELL) continues to increase. In the 2013- 2014 school year, 5.3 percent of students were reported as ELL up from 5.0 percent in 2012-2013. The number of computers available to Iowa students continues to increase. In 2012-2013, there were approximately 1.4 students per computer. This compares to 4.1 students per computer in 2000-2001. What other data can we pull from this report? The National Assessment of Educational Progress (NAEP), conducted by the U.S. Department of Education since 1969, is the only national assessment of student achievement. The NAEP state assessments have been administered periodically in grades 4 and 8 since 1990 in the areas of reading, mathematics, science, and writing. 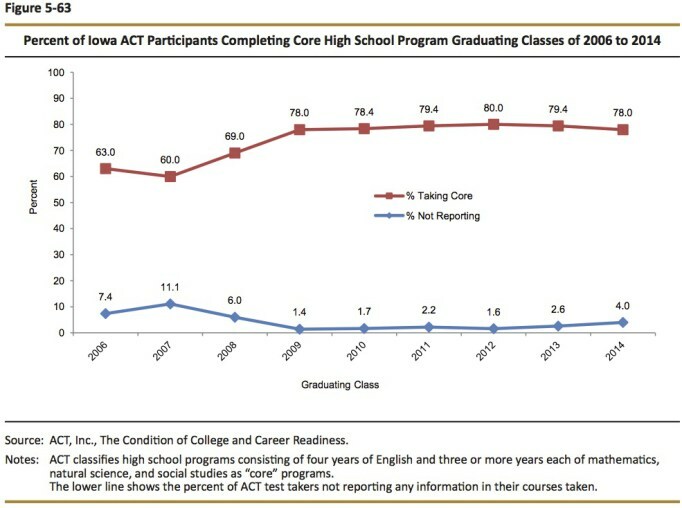 In 2009, Iowa participated in the first state NAEP assessment for grade 12 students. NAEP assessment scores in reading and mathematics are reported on a scale range of 0 to 500 while the science and writing assessments are reported on a 300 point scale. 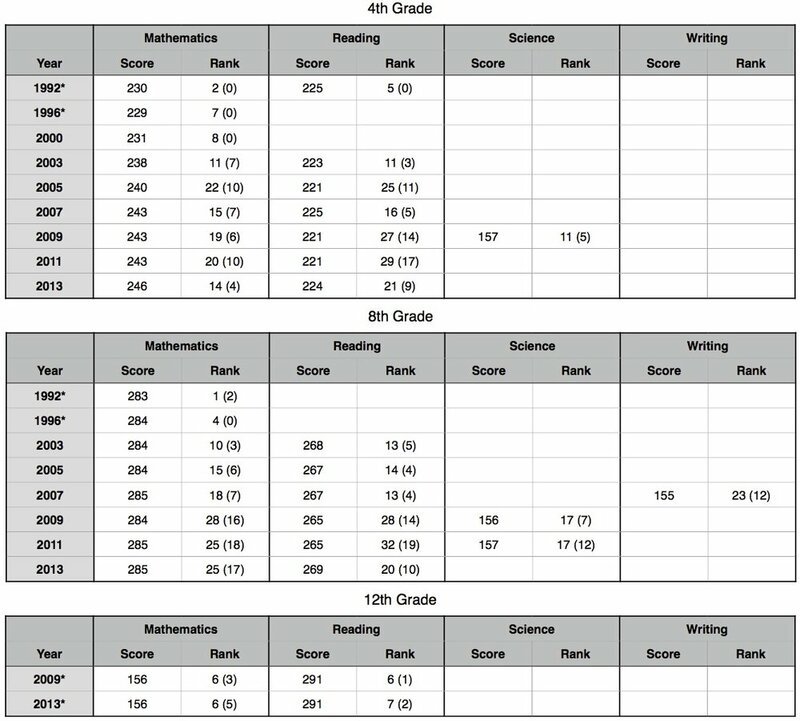 Iowa’s average assessment scale scores in 2013 exceed the national averages in grades 4 and 8 for reading and in grade 4 for mathematics (Table NAEP 1). The Iowa average score in grade 8 mathematics is not statistically different from the national average. The National Assessment Governing Board uses three achievement levels for reporting student perfor- mance results: Basic, Proficient, and Advanced. Basic represents at least a partial mastery of prerequisite knowledge and skills that are fundamental for proficient work at each grade. Proficient represents solid academic performance, and Advanced represents superior performance. Students not achieving the Basic level are classified as Below Basic. In 1992 and 1996, accommodations were not provided to students taking the assessment. In 2009, only eleven states administered the 12th grade assessment. In 2013, only thirteen states administered the 12th grade assessment. Blanks indicate the assessment was not given. Numbers in parentheses indicate the number of states who scored significantly higher than Iowa. According to the National Education Association's Rankings of the States 2014 and Estimates of School Statistics 2015, Iowa ranks 26th in the nation in Public School Revenue per Student in Fall Enrollment 2013-2014 with $11,887. This number is the total amount spent per student, whereas the SCPP mentioned above is money spent from the General Fund. The General Fund is the primary funding source for school districts in Iowa. What happens if we compare these dollar amounts to the schools that ranked higher than Iowa on the 2013 NAEP? For this chart, I looked at the 2013 NAEP for Mathematics and Reading in 4th, 8th, and 12th Grade. I counted the number of times a state was ranked higher than Iowa, differentiating between when the score was identified as "significantly higher" vs. "not significantly different." I then input each state's public school revenue per student in fall enrollment for 2013 from the NEA chart above. This chart is sorted in descending order based on the amount of per pupil spending for each state. Iowa is behind in how it funds education. Between the economic recession that began in 2009 with its resulting across the board cuts and the consistent underfunding since, schools in Iowa have been forced to "tighten their belts." They are already operating at maximum efficiency. Comparing Iowa's per pupil spending with other states reinforces this conclusion. Can we expect Iowa schools to be "first in the nation" when our funding is 26th and below the national average? Iowa students scores on state and national assessments have remained consistent or increased over the past twenty-three years. The Governor's choice to use the word "stagnant" reveals more about how well Iowa educators have done to do more with less than it does about the progress of Iowa's students. Districts have been forced to make cuts over the past seven years, yet students scores have maintained or increased. The blame for other states surpassing Iowa lies not with our schools. This is especially clear when compared to states that our spending more pupil than Iowa. Governor Branstad does not know what is best for Iowa's future. Governor Branstad has come up with many excuses for why he supported only a 1.25% state supplemental growth rate (school boards were calling for 6%) and vetoed one-time funds of $55.7 million. It is the "fiscally responsible" choice. Superintendents have poorly spent the funds the state has given them. The avian flu and depressed farm income have left us with not enough funds for education. Iowa's Department of Management reported on August 4th that Gross General Fund Receipts are up 5.1% for a total of $491.2 million. That's $15 million more than last year! We don't have the money? The State of Iowa has awarded $84.1 million to Iowa Fertilizer as it builds a plant in southeast Iowa. In exchange, the company agreed to provide 169 jobs. Iowa Fertilizer is requesting a further $25 million in incentives. This $1.9 billion facility being built will provide Iowa with 180 jobs. $109.1 million for 180 jobs. Meanwhile, the governor vetoes a bi-partisan agreement of a one-time $55.7 million shot in the arm for Iowa schools, and over 1,100 teachers lose their jobs between pink slips and attrition through retirement. Pardon my French, Mr. Governor, but I call bull. We need to make our voices heard. The Iowa State Educators Association will be walking in the Iowa State Fair Parade to protest the governor’s recent vetoes of education funding and funding for Iowa’s two mental health facilities. Pat Kearney is calling for "parents, students, teachers, administrators, school board members, and concerned citizens" to come to the capital on Saturday, January 16th to let legislators know our concerns for the future of Iowa education. We need to get our voice heard. The general public and state legislators need to know what Iowa students need. They need to be aware that local districts have cut education budgets to the bone. They need to know our Governor and other Republican legislators are not backing up their rhetoric with hard data. Let's bring the discussion to them well before it is time to set funding for the 2016-2017 school year. It's time to fight.